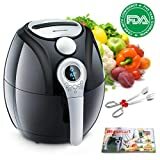 Utopia Kitchen 3.2 Quart Air Fryer Cookbook Included 50+ Recipes is currently selling at $59.99, which is its normal price. It has a lowest price of $59.99 and is selling within its usual range. Price volatility is 0.15% (meaning it does not change often), so you might have to wait a while for the price to drop. Until then this is a recommended 'ok deal'. The current deal is also the best price on this item over the last month. 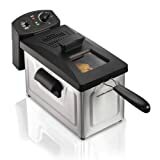 Compare the current price, savings (in dollars & percent) and Buy Ratings for the top Deep Fryers that are closely related to Utopia Kitchen 3.2 Quart Air Fryer Cookbook Included 50+ Recipes. Here is how Utopia Kitchen 3.2 Quart Air Fryer Cookbook Included 50+ Recipes compares with other leading Deep Fryers. 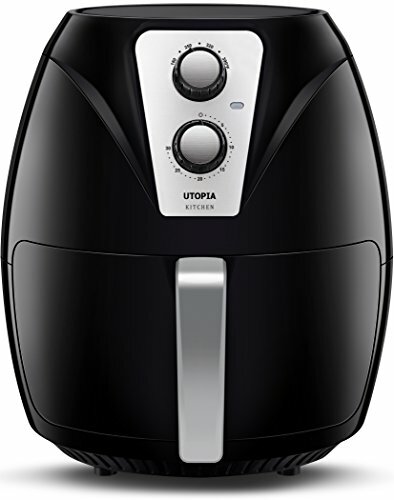 Enjoy mouth-watering fried food, without using unhealthy oils, with Utopia Kitchen’s 3.2 Quart Air Fryer. The air fryer uses micro-swift technology that helps in heating the air to cook your food quickly and evenly. The frying basket has a capacity of 3.2 quarts which makes it quite easy to fry things up for the entire family. Improved micro-swift technology allows for the circulation of hot air that results in crispier and deliciously cooked food. There is a 30-minute dial timer which allows for precision while cooking. The fryer turns off automatically when the timer is up. Can heat up to 390? Fahrenheit. Apply the most suitable temperature for everything varying from pizza rolls to frozen vegetables. Comes with an exquisitely designed cookbook with 50+ fingerlicking recipes to spice up your taste buds.